Mercury is problematic in the petrochemical industry as it can be a major safety hazard; it forms amalgams with several metals, particularly aluminium, which leads to liquid metal embrittlement (LME). This can affect pipeline welds, cryogenic components, aluminium heat exchangers and hydrogenation catalysts. Failure of these components can lead to a plant shutdown, with severe economic implications, or, in extreme cases, uncontrolled loss of containment or complete plant failure with catastrophic results. The mercury concentration in crude oil can range from sub ppb to thousands of ppm depending on the well and the location. This is of critical importance as crude oil is the feedstock for many petrochemical applications. Similarly, mercury concentrations in natural gas can range from below 1ng/m3 to greater than 1,000µg/m3. LNG, LPG, naphtha and condensate are also known to contain mercury. Mercury removal units (MRUs) are frequently used to minimise corrosion and to improve product quality, but their efficiency and lifetime must be monitored to ensure the specifications are being met. 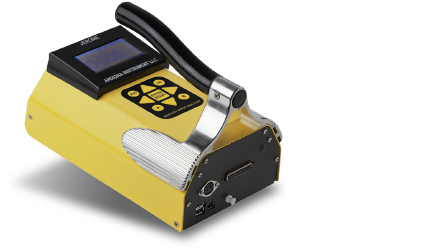 ABLE Instruments’ Mercury Vapour Analyser, the Jerome J405, is typically deployed in the harsh offshore environment for protection of personnel when breaking containment. Spot checks for mercury will be carried out before continuation of work and testing may be required within the vessels themselves, with limited access; the robust design and portability of the Jerome, together with its ability to provide instant, accurate results, make it admirably suited to the application. The high specificity of the Gold Film Sensor technology precludes the possibility of erroneous readings from common interferents such as water vapour and measurements down to 0.5ug/m3 are easily achievable. Almost all oil and gas is found within the tiny spaces in sedimentary rocks, mainly sandstone and coarse-grained limestone. Bedrock limestone and sandstone, even though hard, also contain lots of pores that can contain water or oil, or gas and other elements. Along with the gas and oil is a mixture of sand, silt & mud. This sludgy silt mud is rich in heavier metal elements including Uranium and Mercury. Even the heavy Uranium can be suspended in the product as it is drawn from the well. However because mercury exists naturally in vapour form it is readily drawn along with the gas product. Where these contaminants end up in the plant depends on many factors. Mercury as suspended vapour in the product will act in the same way as many other oil and gas products. As mercury will evaporate and produce harmful vapours at relatively low temperatures, when a vessel containing mercury droplets is depressurised, these vapours will be released. When breaking containment, even though a thorough gas test may have proven that no flammable gas is present, the vessel could still present a significant health risk from invisible mercury vapours. For more information about the Jerome J405 mercury vapour analyser, please click here.